For decades, Steve Smith, glass artist, has marked time with beauty. 30 years of collected daffodils poke their heads through the sun-warmed earth at the hope of a new season, and cascade, year upon year, around the green fields of Steve and Sally’s home. His home is his workplace and a product of his desire to create beauty from ordinary objects. For the former Vice President of M&B Hangers (and husband of the granddaughter of M&B founder Milton Magnus), all it took was a moment in time to mark a new and beautiful stage of his own life. A career-ending heart attack in 2004 could have had the power to send one into a dark depression. But Steve, confident in himself and determined to find satisfaction in a new way of life, re-sculpted his day-to-day with a new medium. What seemed like a setback was the advent of a new life of creating works of art in his studio in rural Alabama. 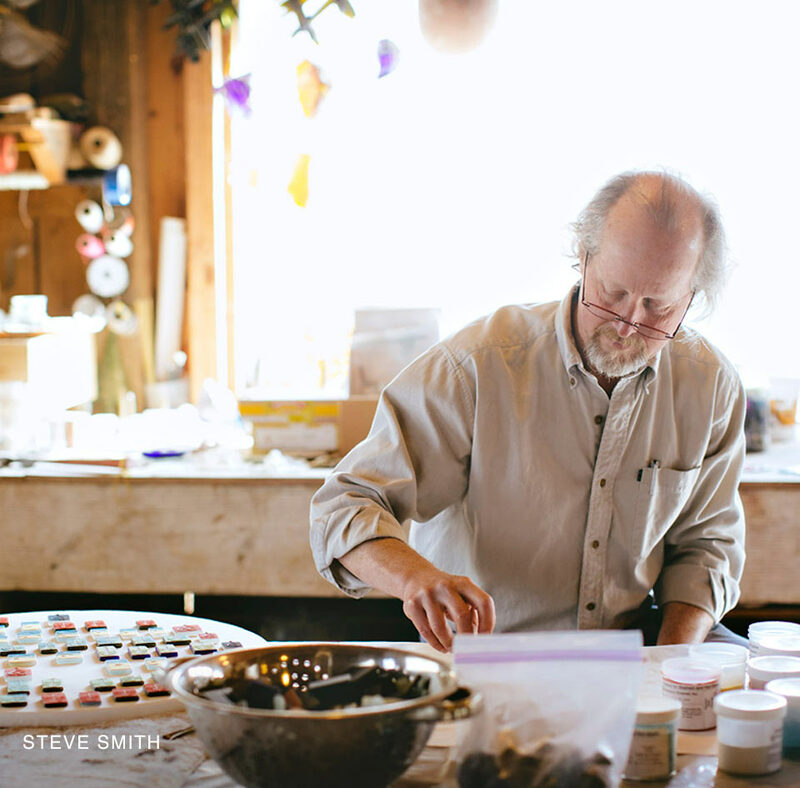 A faded wooden barn is Steve’s creative sanctuary. The sunlight from the glass he has given life to splashes colors through like a kaleidoscope. Just outside, under the rows of crepe myrtles that he has grown up from seedlings, are the buckets of bottles—Sky Vodka blue, Heineken green, cola clear—laid out like a watercolor palette, to be melted and mixed, tumbled and etched, drawn upon and repurposed into works of art. They’ve been collected and donated from friends over the years, and one could say that Steve truly works with what he is given, creating “art from empties”. Inside the barn, the open room—tinted gold with sunlight that bends through worked Chardonnay bottle remnants—is methodically laid out for the craftsman to work. Jelly jars filled with tools and sundries hang from a workbench shelf, and colanders brim with circles of glass, smooth like bright, fresh-picked berries. This place is where Steve’s process happens—and being self-taught, Steve admits that even his process is a process. “I don’t always know where a project is going to end up when I start it,” Steve says. His work evolves organically. Through trial and error, experimentation and happy-accidents, Steve has over nine years learned the nature of his medium, and continues to find new ways to mold the material. A recent project sits in the window—mushrooms on a log. Small wine bottle punts (the small “hump” in the bottom of a wine bottle) are texturized through the tumbler, Steve explains over the soothing sound of the mechanical turning cylinder. These translucent punts become fungus caps; reminiscent of the handsome wild mushrooms Steve grows just outside his studio. As he gazes into his open kiln at the glass forms smoothed over by the refining heat, it is apparent that his appreciation for beauty and his reverence for time are only matched by his care for the craft. “I’m always thinking about the way things look through glass,” Steve says. It is all about learning through varying perspectives. As glass filters light, refracting and bending rays and softening harsh streams, glass also provided a beautiful obscurity of perspective—a lovely distortion of what Steve’s life plan may have been expected to be. Steve Smith’s work is featured in galleries across the Southeast. For more information, please visit campcreekcreations.com.